For a little less stressful topic than the last one, let’s turn to that favourite Canadian subject (i.e., my favourite topic) – the weather. It is true that we may find ourselves having difficulty with the longer, colder winters than we are used to but, truth be told, we have been more worried about the summer weather. Would we be able to handle the heat and humidity? We have been in Toronto in several summer heat waves in the past when the heat and humidity seemed unbearable and the sky was an unattractive grey smudge colour from both the humidity and the pollution. So we were not looking forward to much of that kind of weather, especially since the Cottage in which we are staying until our house is finished does not have air-conditioning. We have now been here about 7 weeks, nearly 50 days, and summer is almost over. How have we found it thus far? Mostly, it has been better than expected. Until a couple of weeks ago, temperatures were cooler here most days than it was in the Fraser Valley. A few days were somewhat warm and humid but mostly we experienced sparkly blue-sky days with wonderful breezes. A fairly typical blue-sky day with white puffy clouds and nice breezes. 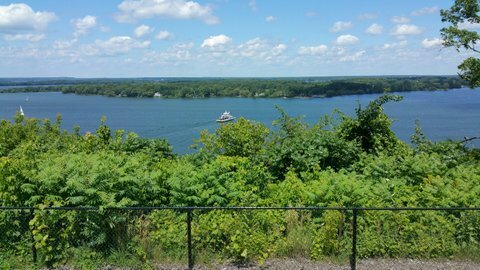 From Lake on the Mountain lookout, looking across Adolphus Reach (of the Bay of Quinte) to Adolphustown in Greater Napanee. When temperatures were on the warmer side, the forest canopy over the Cottage kept it cooler in the house. 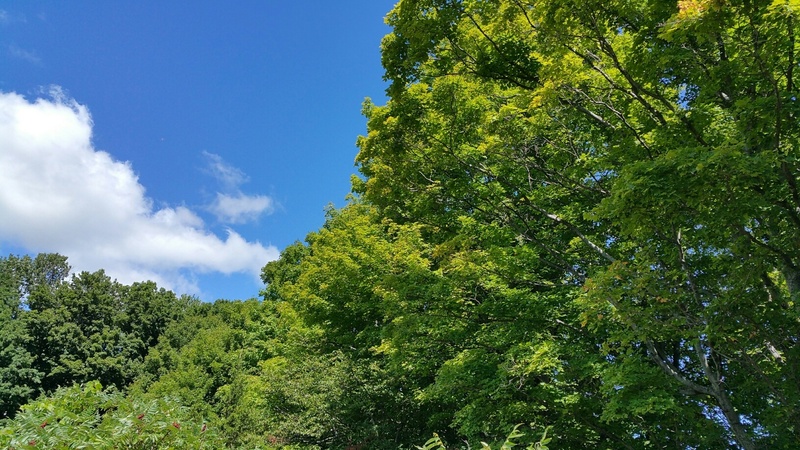 Bright blue sky over the hardwood forest at the north end of the farm. Up at the new house site, there is less shade to reduce temperatures but most often a fairly strong breeze comes up off the lake. Looking south from the upstairs of our house just at sunset. One of many blue-sky days with white puffy clouds and lake breezes. It has rained more frequently here than we are used to in the summer; approximately once a week but usually for only a few hours at a time. We have only experienced one day thus far in which the sun did not shine for at least part of the day. Once or twice it has been raining in the morning but soon cleared up. More often a sunny day has clouded over later in the day and we have had thundershowers in the afternoon or evening. We had one good storm that delivered over an inch of rain and several other rains that were substantial enough to give the newly planted chestnus trees a good soaking. I have been keeping track of the amounts with the great rain gauge that Jonathan gave to me. 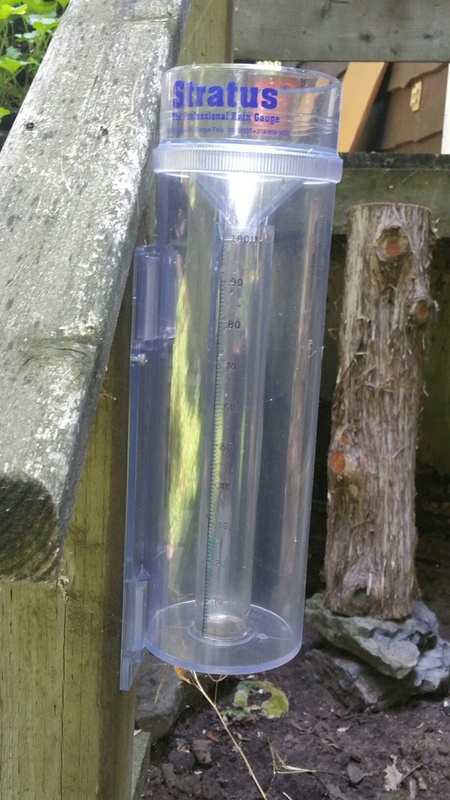 This rain gauge has been useful in measuring rain fall to within one-hundredth of an inch. But the weather has been different for the last few weeks. We have had no rain for nearly 2 1/2 weeks and it has been quite warm and humid on most days. Even though it has not quite reached 30 degrees Celcius here in the daytime because of our proximity to water, we have really felt the heat over the past few days and nights – especially the nights when the breezes stop blowing and the air feels very close. The low temperature last night did not go below 23 degrees Celcius and it was humid enough that one often felt wet and sticky, even with the fan blowing. Today is still warm and humid, but it is different in that a fairly strong wind is blowing. It feels almost tropical because of the warmth and humidity and we are finding it quite pleasant. We sat in the shade on the wharf across the road for a while this morning and enjoyed the effect of the wind coming in off of Smith Bay. 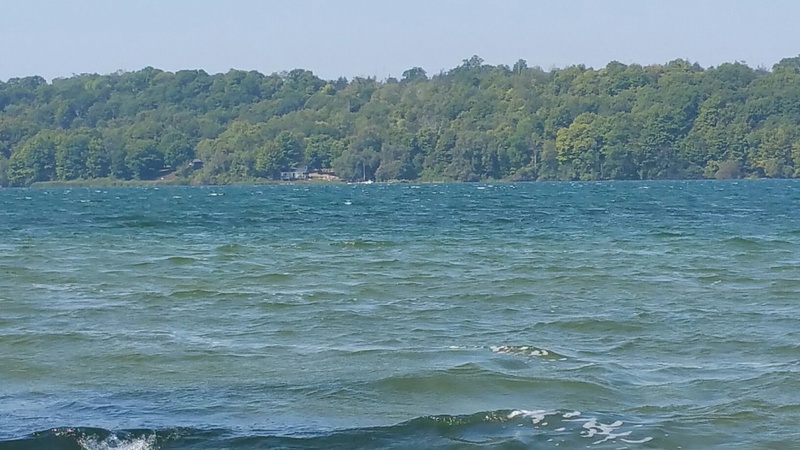 The bay is not large but the wind was strong enough to kick up some whitecaps. 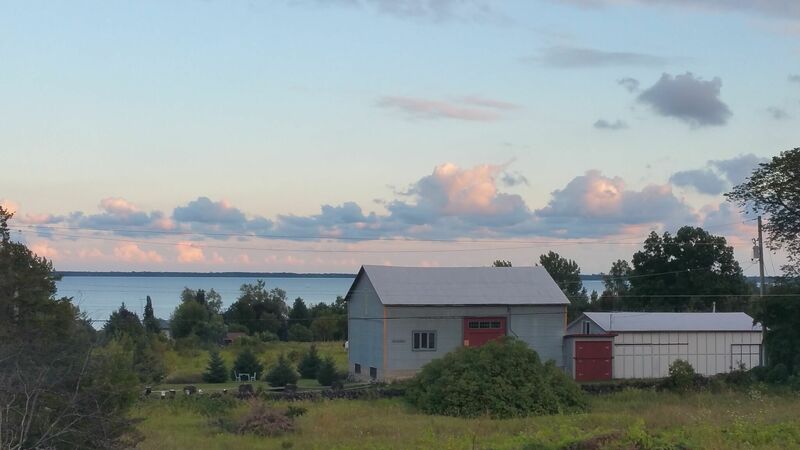 Smith Bay (of Lake Ontario) from the wharf across the road from the cottage. It is rare to see white caps on this small bay. If you look very closely (as always, click to enhance the photo), you can see the faint beginnings of fall colour in the trees across the bay. The weather is forecast to change tomorrow with some clouds, showers and cooler temperatures. By weeks end it is forecast to get down to 10 degrees Celcius at night! We look forward to it being cooler and hopefully the showers are heavy enough to give the newly planted chestnut trees a good soaking. I needed to haul water out to them last week, for the first time this summer, and would prefer that they not need it this week.